XING is the social network for professional contacts. Almost 11 million professionals are registered on XING. On XING, professionals from all sectors are networked, they seek and find jobs, employees, assignments, cooperation partners, professional advice or business ideas. Members exchange online in more than 70,000 specialist groups and meet personally at XING events. The company was founded in Hamburg in 2003 and has been listed on the stock exchange since 2006. 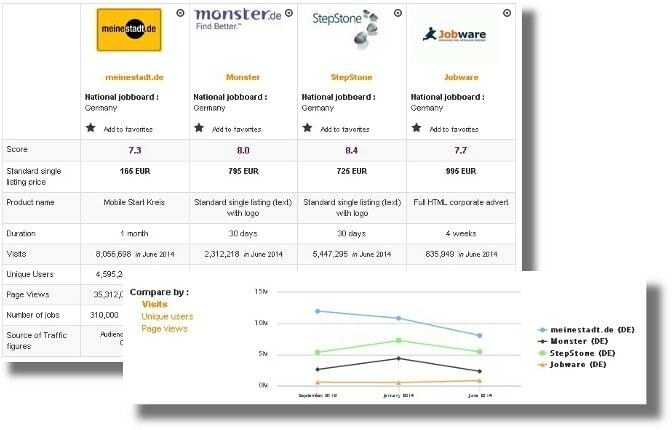 The Jobbörse.com website, with more than 2.5 million jobs the largest job search machine in the German-speaking world, belongs to the company's portfolio. Summary: Founded in Hamburg in 2003 by Lars Hinrichs, Xing has become the leading business network in German speaking countries with over 15 million users. It is in fact the 110th most visited website in Germany. Since 2015, it is considered a “unicorn company”. Indeed, it encourages users to see it as far more than a job board: it allows people to connect with others in your field and follow industries. It’s the German equivalent of Linkedin and for now, it is dominating the D-A-CH region. On social media, Xing is popular with 49 900 followers on Twitter, 117 894 on Facebook, 8 815 on Instagram, 3 961 on Youtube and 14 683 on Linkedin (with updated information on all their profiles). Design: To use the website, users must create an account. That said, it is actually possible to browse all the Xing members without an account through the directory (and it is even possible to include names and/or keywords for the search). Once your account has been created, your homepage is the newsfeed, based on the companies/people you are following, your friends and your interests. To look for work, you can use the search engine (keywords, location and the radius). The filters (salary, sector, experience, type of contract, domain, advantages, country and city) appear and remain at the top of the page, including the number of offers per category. The publication date and logo are visible in the listing, but the logo disappears when the job offer is opened unless there is a company page, which means there is little branding for the job offers. The company pages, however, are quite attractive. They include the number of followers, the number of employees and how many of them are on Xing. They can also have maps, videos, awards, ratings, etc. Similar jobs appear on the side for job offers. The job board objective: Xing makes it easy to keep track of what’s going on in your field of work. Whether you’re looking for work, wanting to network or just curious, Xing can offer the right service. Recruiter observations: The names of staff are listed in the contact information and photos of management are in the “About” section. 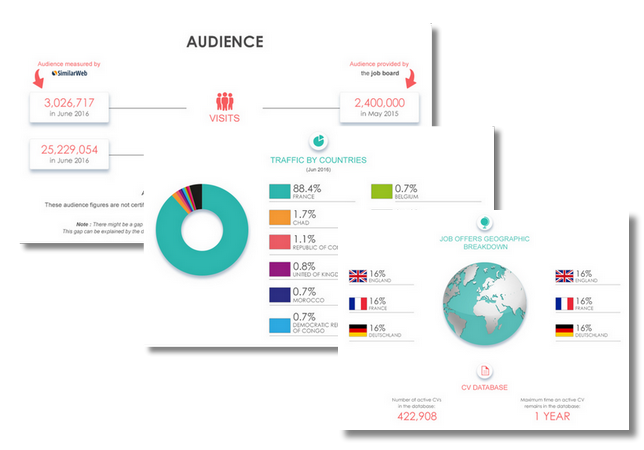 Recruiters create the same kind of account as jobseekers and can create an advert from their dashboard. If you do not define the salary, Xing might do it for you. You also choose skills and specific keywords. You can import a text from a URL or a PDF file. On the side, Xing tells you the kind of members it will share the offer with (including examples). Jobseeker observations: It’s easy to create an account and the top of your profile is your business card (including a photo, contact information and your level of studies). To view the salary on some job offers, you need to have a premium account. For most job offers, you are redirected to a company career page. It's difficult to change your gender or name on the website (unless it is to include a maiden name and married name). The job offers: There are 923 178 job offers. Most of the job offers are for fulltime work. The domains with the most job offers are production, sales & distribution, medicine and IT. Reactivity: Contact information is difficult to find. Special features: The CV builder; the company ratings; ProJobs (for jobseekers); job relevance for you (according to the website); salary comparator (which tells you the salary for a certain number of professions); the blog (in German); the devblog (in English); the events; the company timeline; the fact sheets (current facts and figures on Xing); Youtube videos; the Xing member directory. Verdict: Xing is simple, but also complex. Simple to use, with a wide range of different services, from networking to trends and company information. If you are in business in a German-speaking country, then you need a Xing profile. Login here for FREE to unlock access to the traffic audience, content and pricing section for more information on Xing.